Gross Pollutant Traps (GPTs) are installed to catch stormwater pollution before it enters waterways. GPTs act like a filter, retaining litter but allowing water to flow through. 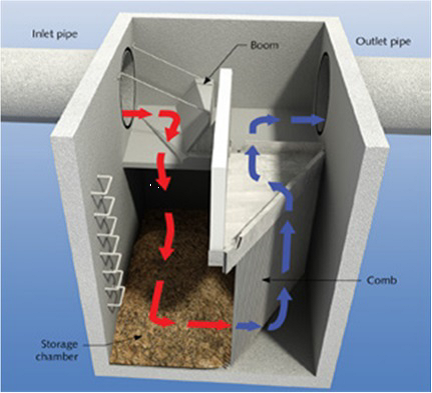 GPTs can also be used as a pre-treatment for stormwater harvesting systems. They prevent litter from entering the system but allow water to pass through. Over time, debris builds up in GPTs. They must be cleaned to ensure that water can flow through and that the collected rubbish does not leach pollution into the water. Litter and debris are removed from the stormwater as it flows through the GPT. The cleaning process is done by a large truck with a suction hose, as shown in the images below. Gross pollutant traps are installed throughout the stormwater drainage network to minimise the amount of little that enters our waterways.